George the Car Guy: Speed is Relative - or is it? I changed my tune about the video after I asked a simple question: what happened during the ride that was not expected? I’m pretty confident that he expected to ride without getting caught, expected to arrive in one piece without crashing , expected the bike to be mechanically sound and most obviously, expected that he was capable of handling the situation. So, given all that, the answer I came up with was: so what? Nothing happened. We make a big deal about distracted driving: talking on cell phones, eating, reading the paper, etc. I doubt very much that these would be issues for drivers going 130 or more. They would be concentrating on getting the job done and would, in fact, be safer drivers at that time. Even at 120 in a 100kph zone, it would seem that the police are less concerned about cleaning up accident spots than they are about losing revenue. To be fair, it’s not the police that are really concerned about revenue loss, it’s the government. The police are just placed as tax collectors. There are times when even the posted limit is ridiculously fast: poor weather, heavy traffic to name but a few. 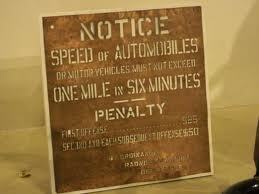 Sometimes we look at speed signs not only as a ‘maximum’ but also as a ‘minimum’. What if we just used common sense? What would happen if speed limits in school zones disappeared? Would everyone forget the 30kph limit and drive like mad when kids are around and cars parked at the roadside? I doubt it. Maybe even fewer injuries would result. What about on the highway? Imagine traffic flowing nicely at 130kph in a 100 zone, everyone paying attention and then someone spots a police car coming towards the column. He steps on the brakes to slow down and suddenly there is chaos. What was the contributing factor? Speeding or changing speed? I have a funny feeling that if all the speed signs disappeared overnight, people would sort themselves out. Sure you’d still have drivers who go too fast for conditions, are impaired either on alcohol or drugs, are unaware of the surroundings, are lost or any other number of problems. Maybe the biker wouldn’t pull the stunt because it would not be such a Big Deal and not be so in-your-face. Deal more harshly with those drivers and those with poorly maintained vehicles. There are better ways to collect taxes and much better ways to deploy the police. My main concern with this individual driving so fast is that, someone or something would come out in front of them, and that's when things go wrong.Some people just can't seem to determine how fast a car is travelling when they pull out in front of another vehicle, or they figure it's there duty to slow them down! The main issue i have with higher speeds is, that there are drivers out there who don't seem to comprehend a vehicles rate of speed when they pull out in front of them. Or worse they think they need to slow them down like it's there duty. You definitely need to be more alert though at higher rates of speed. I had heard of the story but had not watched the video until now.After watching the video a few times my responce was the rider was a reckless idiot.His high speed in the open areas is fine with me ,its the passing cars in the middle at such a high speed where he becomes an idiot.If one of those cars has a person who decides to change lanes while the biker is coming at such a fast closing speed he would be unable to miss it and at that speed even if the driver was not texting and was paying attension and checked his mirrors he probably would not see the biker coming from that far back. As for removing speed limits, the effect in rush hour would be minimal as most people are just going as fast as the traffic will let them go anyway.I know for me when I am driving alone I tend to drive about 10 to 12 kph over the posted speed if the roads clear.If you removed the speed limits I would for sure drive much faster on clear roads but using common sense I would slow up at intersections and traffic congestion.On the open highway I like to be just slowly passing everyone and I doubt this would change if the speed limit signs were gone.As a kid I can remember the speed limit sign on the trans Canada highway through Burnaby reading 90mph(145kph) slower when wet. The problem with common sense on the road is not enough people have it.